A few days before the tree fell, I took this picture to use as the cover picture on my Facebook profile. Pretty close to the same shot today. 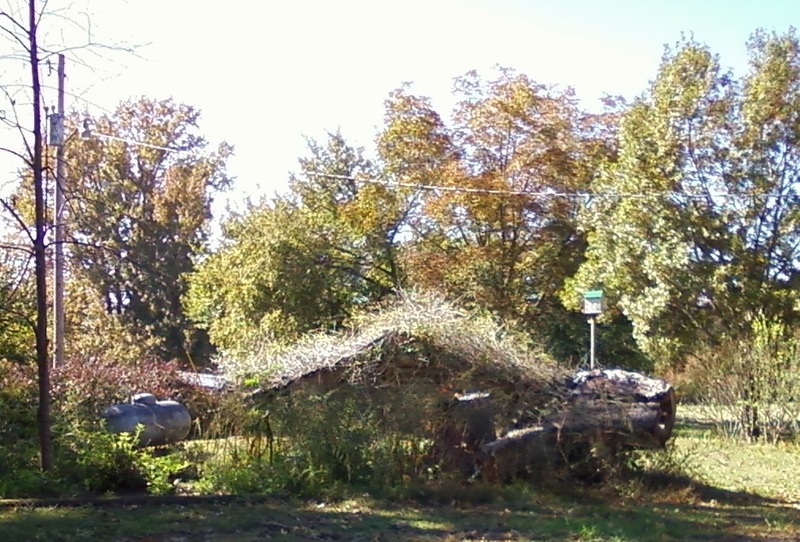 You can see the outline of the old barn in the top pictures, but, of course, the trumpet vine was green then. It actually does not look quite this desolate. The colors are pretty vivid, we're having a beautiful Fall, but they are washed out because the sun was so bright. 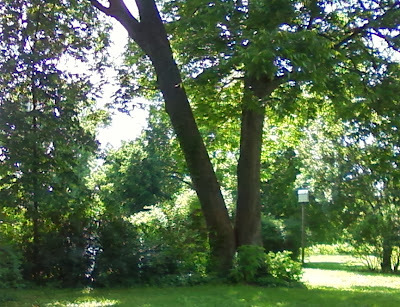 You can see by the position of the small tree on the left and the birdhouse on the right that the scale is about the same. That's the stump of the tree under the birdhouse. It's about as tall as I am, so about 5.5 feet. 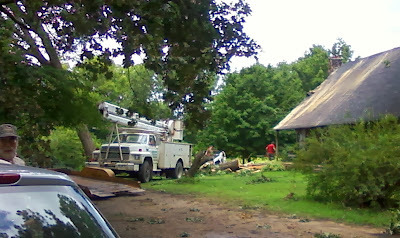 This picture was taken the day after the big event when they had just gotten the tree off the roof. You can see that the edge of the roof looks kind of chewed up and that the remains of the tree are lying across the yard. You can also see that the tree on the left, which had to come down a couple of days later, is definitely leaning closer to the ground than before. That little V-shaped trunk in front of the back of the truck is the remains of this, which was a beautiful ornamental plum tree. One of the things I loved about this house when I bought it was the trees, and so far we have lost six of them, and at least two more need to come down. I can't complain too much because the inside of the house is so much better than before, but it will take me a long time to get used to driving into the driveway and seeing that second view instead of the first. It will take me even longer to get used to driving up on a still winter night and not being able to look at the stars through the branches of the trees, or to waking up on a moonlit night and not seeing their moon shadows across the yard.